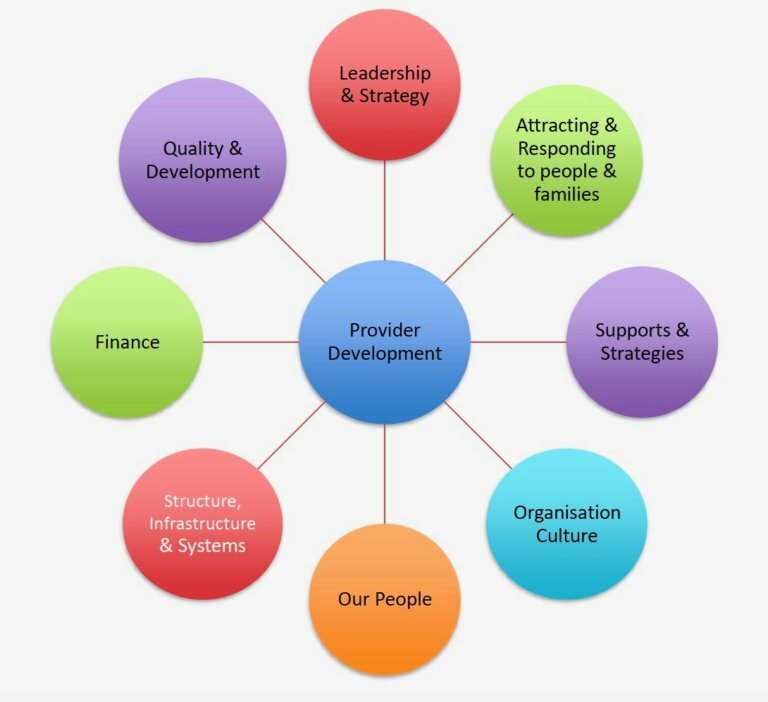 Provider Development is about Service Providers investing in themselves, so they can offer and provide quality supports and services to people and their families. Through recent Provider Development Grants, WAiS has been able to support Western Australian providers through workshops, mentoring, coaching and the development of resources. See links further below for these freely available resources. These grants were funded by the Western Australian State Government, Department of Communities, Disability Services since 2015, and continues until June 2020. WAiS supports Providers across a range of areas related specifically to Individualised Services including Individualised Living Supports, Leadership and Organisational Culture, Individualised Recruitment, Quality and Safeguarding, Structure and Systems. These are shown in the image below. 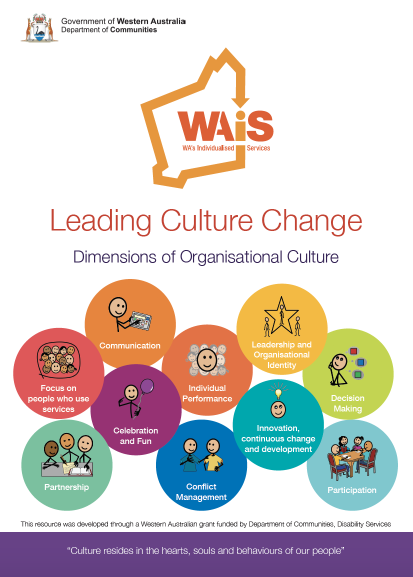 This WAiS resource is to assist providers with reflecting, and taking action with their organisational culture. The simplest way of thinking about organisational culture is that it defines “the way we (an organisation) are and how we behave and act together”. Culture doesn’t happen by chance. It is conscious, deliberate and intentional. Shaping culture is a fundamental feature of leadership shaping a vision for the future. An organisation’s culture can be one of its strongest assets or its biggest liability. In 2018, WAiS designed and delivered a program called Rethinking Organisations. The aim of the program was to assist Support Providers to explore alternative organisational theory and practices that could potentially benefit the human services sector. The program drew on many leading thinkers and many successful organisations globally who have individual development and autonomy at their heart. We also drew on the experiences of the WA participating organisations who all strive to do better with the resources they have. 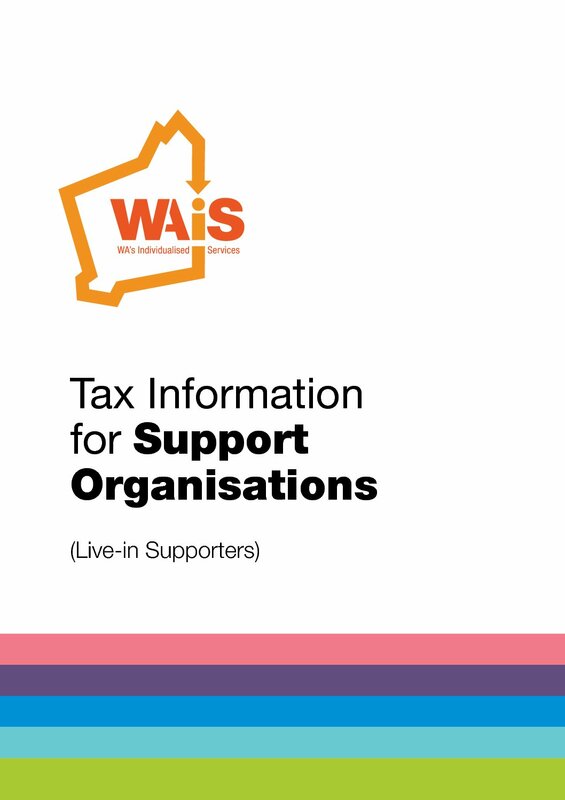 This WAiS resource aims to share some of the learning, both the theory and the practices, that the participating organisations explored. 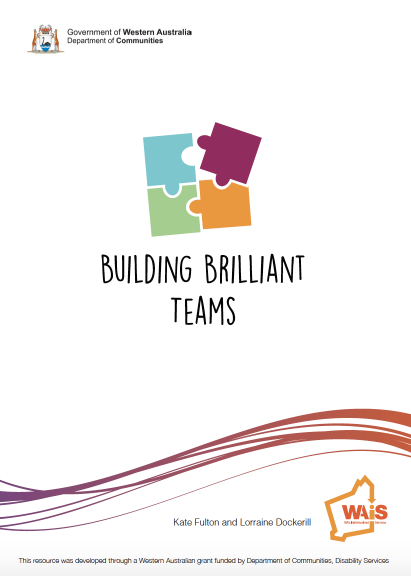 A WAiS resource training pack for organisations to use within their organisation, to create clarity about their purpose, value and offer to people, families and employees. In our ever-changing context in Human Services, WAIS has often been asked to support organisations to assist them to take stock of their current work and create clarity (or a position) on who they are, who they want to be in the future and what they may offer to people and families going forward. Although there are many ways to do this, in partnership with support providers in Western Australia we have used and adapted a specific process taken from Patrick Lencioni’s work in supporting overall Organisational Health. 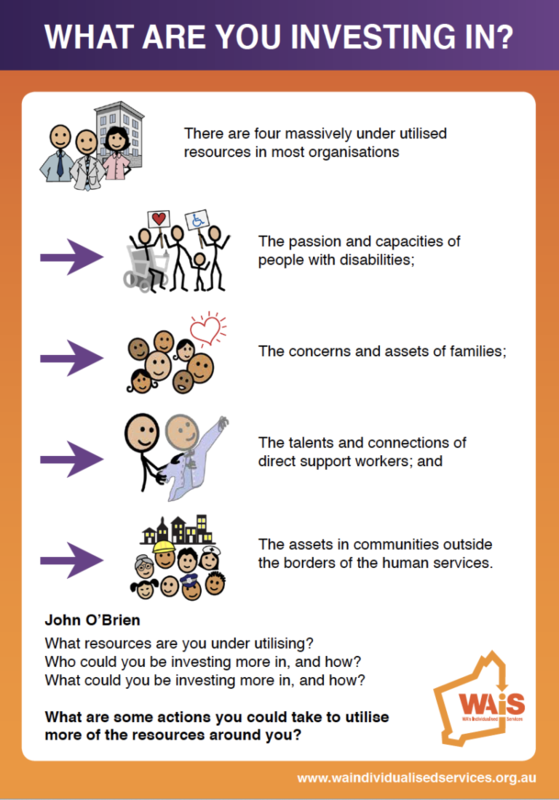 Designing Individualised Support is about deeply understanding what matters to a person, being led by the person and important people to them, and then together, designing support so they can live their own life in a way that works for them. This WAiS resource pack supports any organisation to explore the principles of co-production. It has been informed by people with a disability, families and allies all of whom have impacted on WAiS over the years. All of these people have one thing in common - a desire to explore how we can use the strengths, capacities and wealth of all of us to build richer organisations and communities. A resource created, in collaboration with and advice from KPMG, to provide organisations that assist people to have live-in supporters with the necessary guidance as to whether the supporters are volunteers, contractors or employees. The resource then outlines the various tax requirements and considerations arising from these important distinctions.